Would it feel like a onesie? Last week I went out both Friday and Saturday nights and Sunday paid the price. 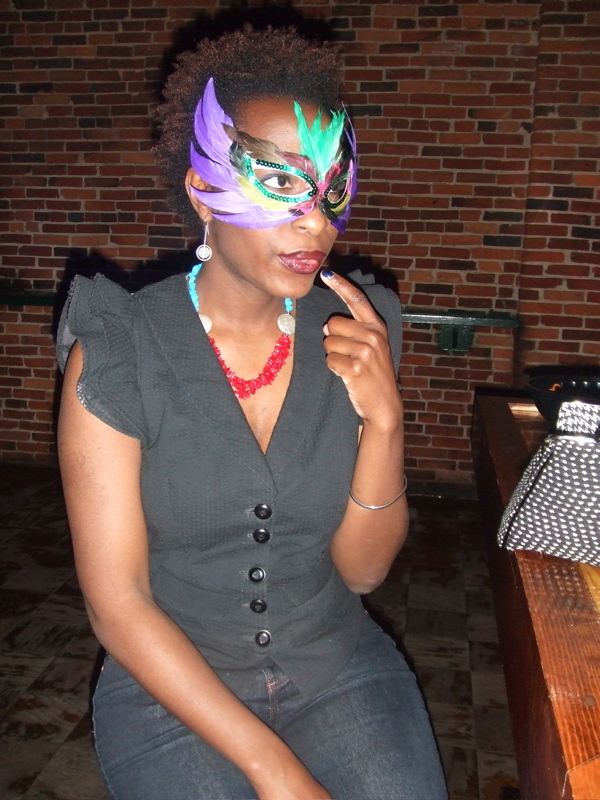 It was a Mardi Gras themed party (hence the feather mask and beads) and I was in high heels until 2:00 a.m. Party Voice all day on Sunday I tell you what. These outings have led me to a dilema. I don’t have a club / party outfit. Trena said she has the same problem. Not looking for anything hoochie, just a step up from jeans a cute top. You know what a lot of people were wearing? 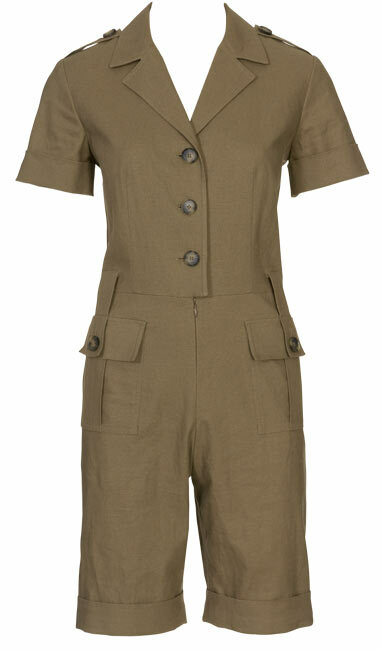 Jumpsuits and shorts. Similar to this April 2009 BWOF ditty. I know it’s trendy and I don’t know if it would work for me. But, I may have to consider it. Although, I think I would feel like I was in a onesie. Some of you asked about my pants sloper. I had to turn it in for my grade (I got a 94) before I could make it up again with the alterations. I now have it back and will make it up over the weekend. Dress sloper is also turned in for a grade. I think there are some minor tweaks, but I’ll deal with them later. Previous Post Anna Maria Horner Winner! Oh my gosh, that reminds me that I had a jumpsuit party outfit in the early 80’s. I loved how it looked at the beginning of the evening but what a PITA after having a few drinks and trying to go to the bathroom in some club and keep the top of the outfit off the floor. NIGHTMARE! It did look good though. Oh. Man. I didn’t even think about the bathroom situation. Cannot be asked to fumble with after a few drinks in the early morning. Sobering. So funny that Christina is the last person to comment before me, as I was just thinking that she is one of the few people who could pull off that look. Dear, you know I think you’re gorgeous and fabulous to the nth degree, but please “Just Say No”. I don’t think I will be riding this bandwagon. My body isn’t for jumpsuits and the issue with practically stripping to use the bathroom is a no go for me. Try it out for us so that we can live through you. Oh yeah, I’ll pass on them this time around. I made one the last time they passed this way, and the fitting issues were myriad. Mine worked out fine, mostly because at the time I had the perfect Vogue size 12 body. But a friend ended up wadding hers, and as everyone says, bathroom breaks were a challenge. Whatever you decide I’m sure will be fabulous! I am old enough to have made and worn one the last time around. It was flattering and comfortable. But, going to the bathroom? Don’t drink too much if you’ve got a small bladder. If you wear a belt with it you’ve got to take it off and hang it up, if you’re lucky enough to find a hook in the bath stall you’re in. There must be something easier to wear that looks great for clubbing. The bathroom deal is an issue with a jumpsuit. Aside from that, you are young and have a great figure. Wear what you want and enjoy it while you can. Little black dress. Seriously. Although, since I avoid clubs like the plague, I have no idea what people are wearing nowadays. Do you really want to get half undressed to be able to pee in a public ladies room? Yes this outfit would work for you, in fact it will look stunning and I WANT to see you wear it! I agree about the getting undressed to go to the toilet, though! I lived through the body suit fashion of the 80’s and I know how hard it can be! What about a pair of shorts and a top to mimic the effect? 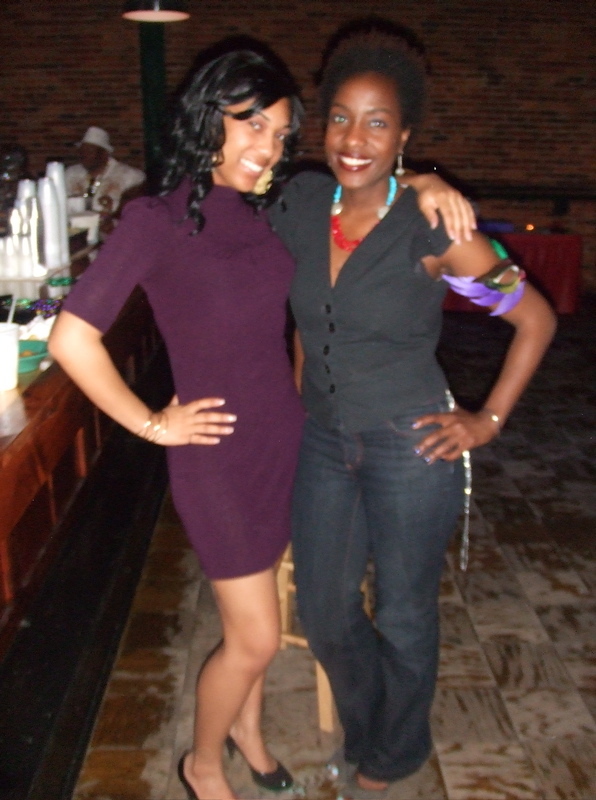 I always stick to skirts and heels with cute little tops for this sort of event, although I am way too old now!! I second the little black dress idea. Or a little any-colour dress…actually maybe specifically NOT black, EVERYONE does black. A little “your-best-colour dress”, how’s that? My question is always, how does one use the restroom is such a get up? Very chic but hmmm.. . I would definitely rock that. I think I may need to get that pattern. Too cute! You guys look like you were having too much fun! I remember making one and wearing one in the …. uhh early 80s? Gosh, I forgot I had one, made from denim, with long sleeves and a long lapped zipper in front. If you make jumpsuit, you will be able to make it look flattering on you ’cause we have seen your sewing skills. I will share a hint for using bathrooms while wearing a jumpsuit: face the toilet while you lower the top part of the jumpsuit, so that the sleeves don’t end up in water. Don’t ask how I know…..
I’m not a “pants onsie” person…too many issues with it. Have you thought about doing the pants/shorts and a jacket – sort of like a suit type look. I think you can make a really fab jacket (3/4 sleeves) and do something with the neckline to make it more evening-ish….less high neck and more lower, and the shorts and it makes a stunning outfit and very wearable to other events too – dinner even cocktail. I’ve been wanting to do something like this for a while, and might get something done for this summer. Be fun to see what you do! Well, adding snaps to the crotch would definitely make it feel like a onesie! LOL 🙂 Honestly, if “everyone” is wearing a onesie, I’d think you would want to wear something else! The bathroom issues would be enough to scare me off this get-up. I left my last jumpsuit at the drycleaners in 1986. I agree with the others: resist. I’ve actually had a couple of similar outfits (but with long pants) back in my dating days and everytime I wore one, I got tons of compliments for looking great and being “pulled together” I think it’s a great idea for you and I think you would like it. the only downside is trips to the bathroom because you have to get almost completely undressed. The thing I like about the one piece is that it tends to downplay the thigh area – which I have more than my share of. I think I have to say no to the jumpsuit look — totally onesie! I was surprised to see the style in the latest issue of Burda — I actually cringed. I think a dressy top, shorts and heels would be really cute and much more practical. I love the jumpsuit and think it’d look great on you, but I’d make it separates because of the whole “peeing” thing. I would hate to have to take the whole thing off just to pee. Hmm, I really need to see one on you, I’m not categorically against it but it is hard to pull off. I’d do some snoop shopping and then decide. But I do think there are a lot of better options for going-out wear. Wrap dresses, skirts in dressier fabrics, silk blouses, etc. It’s not just getting undressed in the stall – the top half inevitably gets dropped on stall floor . Ewwwwww. Been there, done that so looooong ago. Otherwise you would totally rock the look. Have you considered the onesie solution? snaps along the legline? I like one pieces- everything is pulled together, but the getting undressed part…maybe at a bar…but I remember summery outfits, and the serious airconditioning in the south making life very difficult. It’s a great look, though, and you could carry it off so well. I’ll chime in with the choir, the jumpsuit is party-licious until the group trek to the ladies room. If you don’t mind doing a strip-tease in a bathroom stall, go for it. I also saw that jumper, and thought it rocked! I’m a jumper girl, I love the look and I think it will look fab on you. I’m not really put off on the restroom issue, I actually still wear them, and plan on making this look also. Good luck! You look great in the pictures, Cidell! That jumpsuit is on my list!